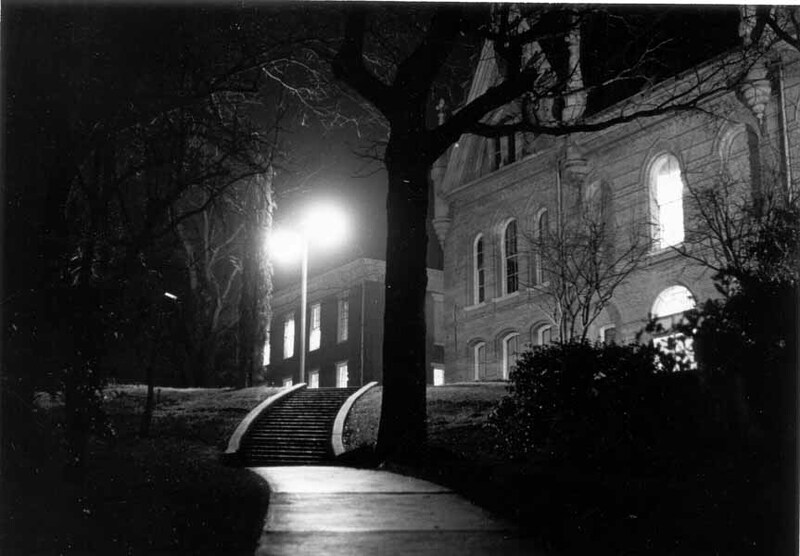 The charm of the campus of SHSU changed forever on February 12, 1982, when the “Queen of the Hill,” the Old Main Building caught on fire. Today the Old Main Memorial, “The Pit”, is all that is left of the original building. Built to show the footprint of Old Main, it serves as a reminder of a once great building that was lost too soon. 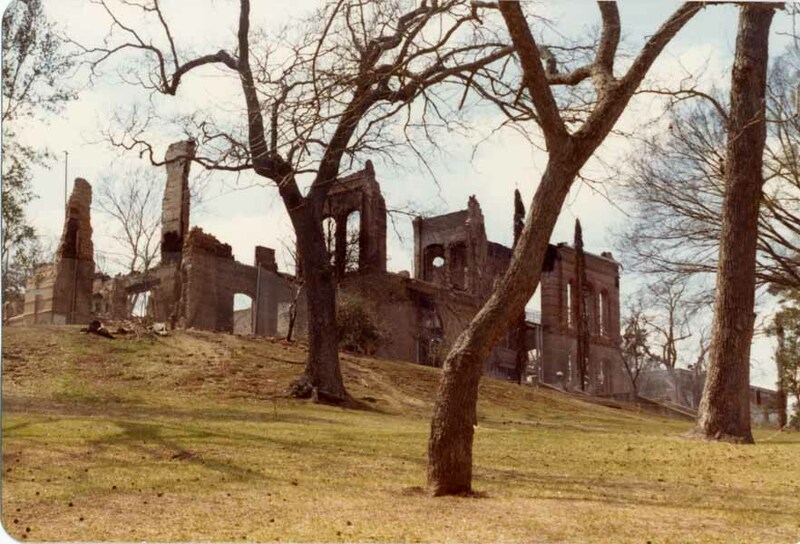 Above is a photograph of the aftermath of fire taken from the bottom of the Old Main Hill. 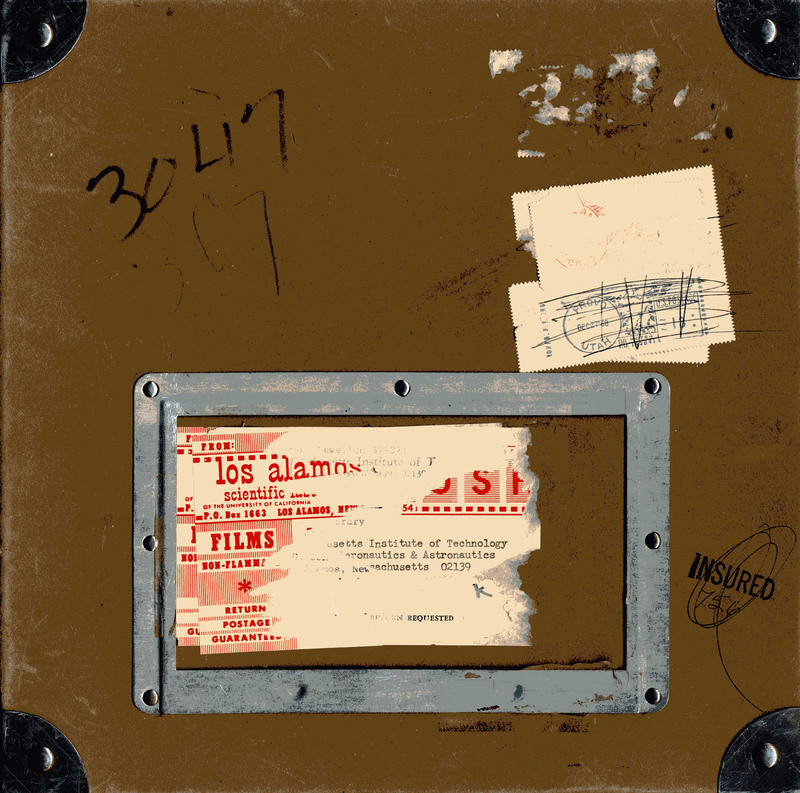 The SHSU University Archives holds many Old Main Fire photographs. We are always looking for more photographs, of the interior of Old Main, fire, aftermath, or other memorabilia from the building. 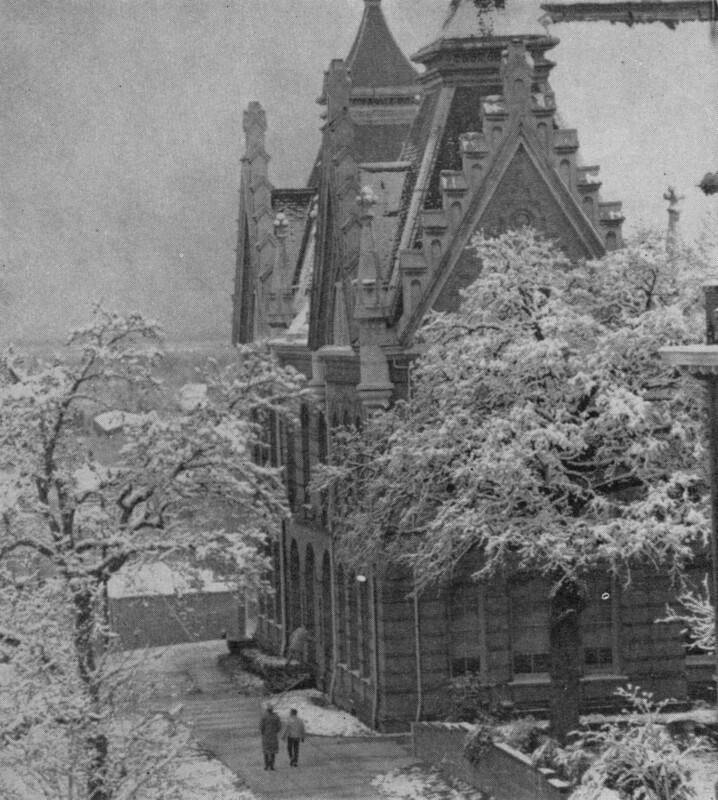 The University Archives has also Included two of our favorite photographs of the Old Main Building. The Special Collections and University Archives would like to wish everyone a Happy Holiday and good wishes for the New Year! This 1922 Christmas Greetings card is part of a two-card collection of greeting cards done by Albert Rutherston and published in London by the Crown Press. Albert Rutherston was a British artist who painted figures, landscapes, illustrated books, posters, and stage sets. He was the author of a book called, “Decoration in the Art of the Theatre,” 1910. This title can be found in the main library collection at call number, PN2091 .S8 R89 1919. You can find these greeting cards in the Special Collections, Thomason Room, under John Drinkwater Christmas Cards, 2016.S12, single item collection. 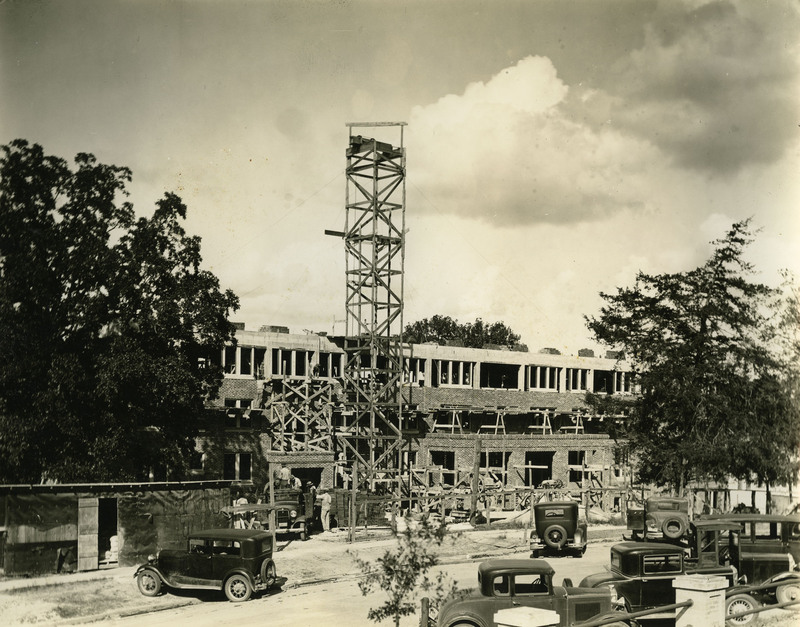 We look forward to everyone coming to visit the Newton Gresham Library Special Collections and University Archives at Sam Houston State University in the coming year. Postcards have always been a great way to remember places that you have been. The SHSU University Archives owns hundreds of postcards from all over the world. 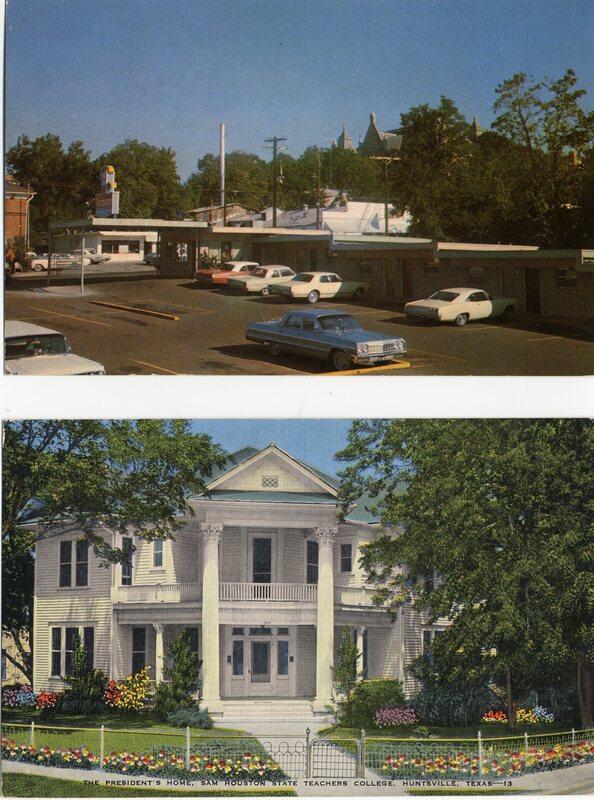 The top postcard features the Center Motel and Chef Restaurant before the motel, restaurant, bowling alley, and the entire block was torn down in 2003/2004 to make way for the first new SHSU dorm in over 40 years, Sam Houston Village. 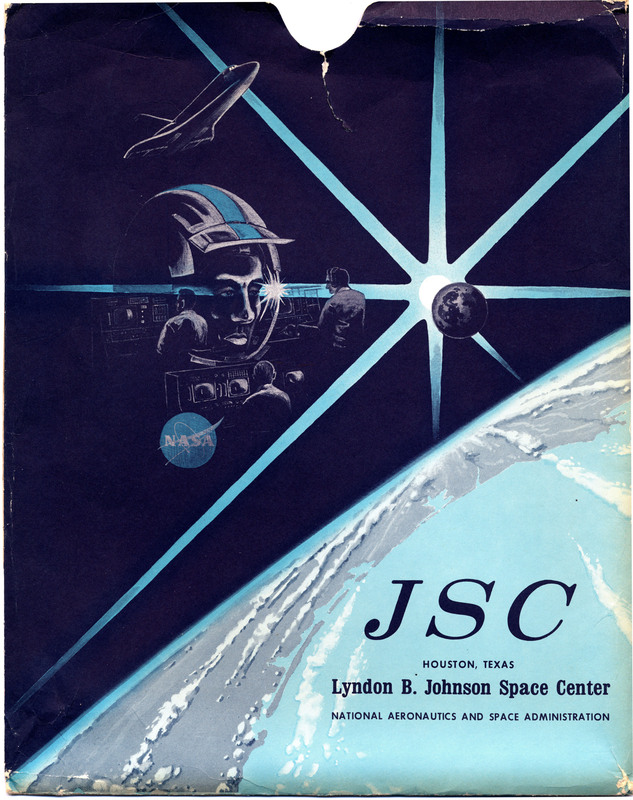 Printed when SHSU was Sam Houston State College, this postcard would date from 1965-1969. Purchased for the view of the spires of the Old Main Building in the foreground it is a great addition to the collection. The bottom postcard is a view of the SHSU President’s House from around the early 1950s or 1960s. The President’s House was located where the Alumni Garden, Clock Tower, and Presidents Tree are now. From 1912-1963 the various presidents of Sam Houston State lived in this house in the middle of campus. In 1963 after President Lowman died the house stood empty until 1964 when the Home Economics Department used it as a Demonstration Home. In 1970, the house was deemed unsuitable for the university and demolished. Later a park named President Park was dedicated on the site. To see more postcards from SHSU and Huntsville,Texas visit the Special Collection Department and SHSU University Archives. These departments are open Monday-Friday, 8-5, and are located on the fourth floor of the Newton Gresham Library. This week’s blog post comes from Special Collections/Archives Intern this summer, Charlesetta Hubbard, History Major here at Sam Houston State. She used materials from the Special Collections/Archives to study WWI to create the blog post and display for the 100th anniversary of the Great War. 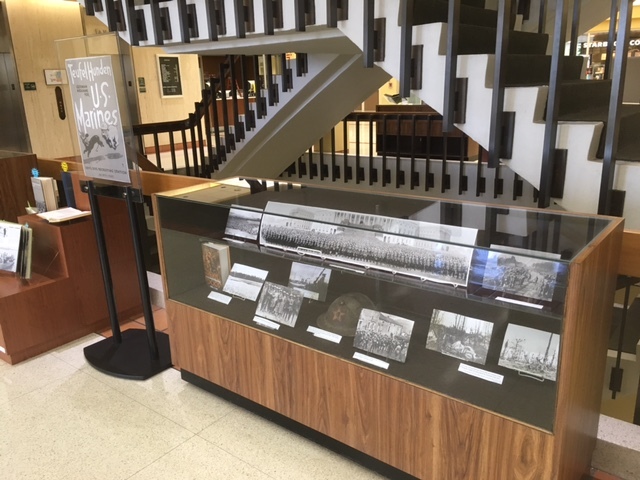 The above image is from Charlesetta’s WWI display on the second floor of the Newton Gresham Library. At least five centuries before the Christian era, the use of fighting men to complement ships engaging in war was common to the Phoenicians and to all costal states of Greece. Marines then were first to fight in naval engagements to protect their own ships, could capture and maintain occupation of the land by harbors, and were able to gather the fleet to execute offensive blows on land. The Marines of today are no different due to the Act of July 11, 1798 that established the foothold for the Marine Corps to grow and become their own operative branch. Although they lent combat aid in the Naval War with France and actively engaged in the War of 1812, the recognition of the tenacity will, and steadfastness of the Marines was not realized or given until they fought off the Germans and halted their progress into France during the Battle of Belleau Woods. Despite lacking an adequate supply of artillery, being outnumbered in manpower, and having a small likelihood of success, the 4th Marine Brigade came out victorious. Their contribution to the war effort in the Battle of Belleau Woods is significant because after its conclusion, the Marine Corps became a recognized member of the United States Armed Forces, it highlighted how essential their role in the war effort was, and it exemplified the reputation for the toughness and dedication that is associated with Marines today. When the United States declared war on Germany, April 6, 1917, the Marine Corps consisted of 462 commissioned officers, 49 warrant officers, and 13,214 enlisted men on duty for only 13,725. Several weeks later, one-sixth of enlisted marines were sent overseas. This formed one-fifth of the first fleet of American troops for service in France. Later, they were joined by the 6th Regiment and the 6th Machine Gun Battalion and combined; they became the 4th Brigade under the 2nd Division of Regulars. General Pershing believed that American troops could win the war single-handed, but not without being trained in more than just the essentials of trench warfare. 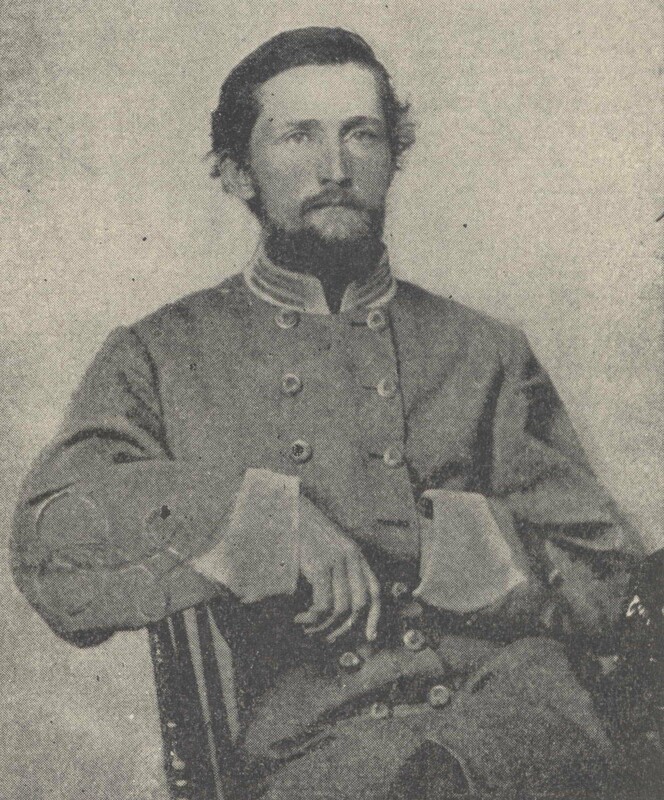 He wanted emphasis put on marksmanship and bayonet drill, open warfare, war of maneuver, and training behind enemy lines. The Marines were sent to boot camps located at Parris Island, South Carolina, and Mare Island, California where they completed eight- week courses in physical training, drill, close-quarters combat, and marksmanship. 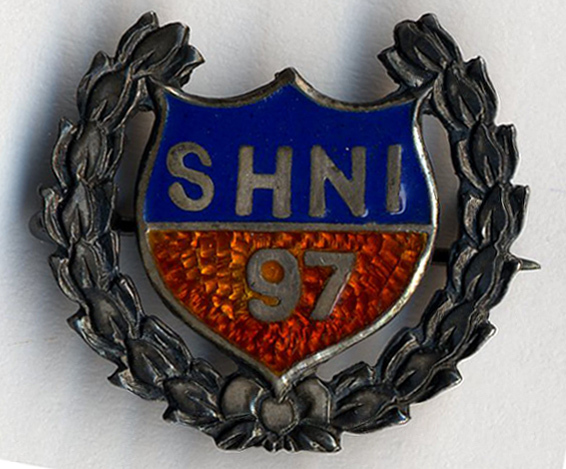 The Swedish system was also adopted as a part of the training and hardening process. Marines exercised with the nine-pound Springfield rifle. This included vertical and horizontal swings, lunges, rifle twists, and front swings. They shot from distances of 200, 300, 400, 500, and 600 yards and practiced rapid fire shooting. After completing volunteer training, they were sent to Quantico, Virginia where they received more extensive training in skills acquired from the boot camps. The training was tough, but it gave the 4th Brigade the backbone they would need in France. It proved both purposeful and valuable, especially in the Battle of Belleau Wood. Between March 21st and July 15, 1918, the Germans had launched no less than five major offenses to solidify a win for the Central Powers and to the dismay of the Allied powers, many of their offenses had been successful in achieving their objectives. In late April, General Ludendorff had approved Operation Blucher and continued the push to Paris. The rapid German push towards Paris, paired with French troops fatigue, lead to the immediate need of alleviation for the Allies. Not as experienced in real time war participation but eager to put what they had learned to use, the AEF deployed the Fourth Brigade. The commander of the French XXI Corps ordered Brigadier General James Harbord’s 4th Marine Brigade to retake Belleau Wood. This task seemed impossible because of the 461st German Infantry’s strategic location on top of Hill 142 and their locations throughout Belleau Wood. They could carry out assaults without exposing themselves to the enemy and dug in to secure these locations. When the battle broke out June 6, 1918 at 3:45 a.m., the Fourth Brigade was welcomed with machine gun fire from all around. The trek through the wheat fields to get to Belleau Wood left them open to enemy fire and the machine gunmen of the German Infantry took full advantage of the opportunity. The 4th Brigade suffered over 1,000 causalities in dead or wounded after the day. Despite heavy losses, they still secured the hill. Next was the task of clearing the woods and pushing the Germans back east. On June 9, 1918, after the heavy artillery bombardment, the marines pressed hard into the woods despite having their allies retreat. The protection provided by Belleau Wood made it difficult for the 5th and 6th Regiments to locate and attack the Germans. They had to launch offensives against an enemy that they could not see. They fired artillery into the woods with no clear site of their target. The leveled trees hindered the rate of marine progress into the woods but also provided the perfect protection. When enemy machine gunmen fired off shots, they gave up their positions allowing American snipers to pick them off. By June 11th, the 5th and 6th Regiments were tired and under-strength but launched an aggressive attack into the middle of Belleau Wood. This attacked changed the tide of the war in in the favor of the Allies and most importantly the Marines. They pushed deeper into the woods changing the fighting into close combat. Here, the Marines showed their advantages in weapon skills, small unit leadership, and morale. By June 15th, the 4th Brigade had secured the southwest side of Belleau Wood. The 7th Infantry was sent to relieve the 5th Regiment, but after failing to clear the remaining portion of Belleau Wood, on 23 June, the 5th and 6th Marines were ordered to go back and finish the job. By June 25th at dawn, 3/5 held all edges of Belleau Wood that faced the enemy and the Germans fell back. On June 26th, Belleau Woods was completely free of German troops. The 4th Brigade proved that they were a force to be reckoned with. They continued to display fortitude and determination despite losing a large portion of troops during the first day, being given sporadic orders by their generals, and engaging in close quarter combat with a formidable opponent. They came out victorious with a win for the Allied forces and a win for the Marine Corps. The Fighting Devil Dogs of World War I embodied the Marine motto, “First to Fight”. 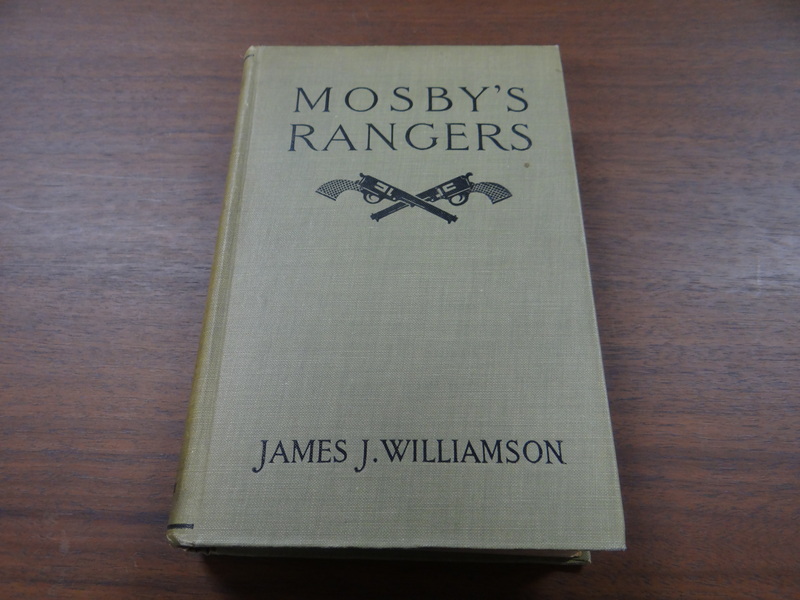 #TBT – In recent months the Newton Gresham Library has started to weed through the collection of books in the library. This 1943 library stamp found in a book called, Stories for Men an Anthology by Charles Grayson, 1925, played an important part in the history of Sam Houston State University, Huntsville, and Walker County. 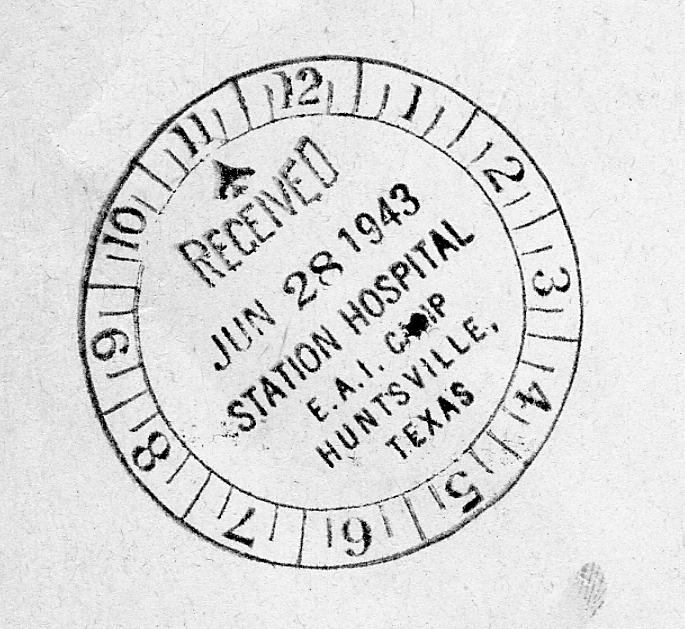 The seventy-four year old library stamp was used to identify books that were from the library of the Station House Hospital in the Enemy Alien Internment Camp, Huntsville, Texas. Commonly known as the Huntsville Alien Internment Camp or the Huntsville Prisoner of War Camp. Built in 1942 the camp held German POWs and later on Japanese prisoners of war. POWs and servicemen who were there were allowed to borrow books from the library while they were in the hospital. In 1946, the camp was closed and then SHSU President Dr. Harmon Lowman acquired the camp, later reopening it to house returning veterans who would receive the G.I. Education Bill that enabled them to go to college or vocational school. Renamed, “Country Campus,” in 1946 the camp became a small city and housed classes for the Josey Vocational School. The “CC” had its own post office, church, baseball diamond, and food facilities.